Discussion in 'Pin Comparison' started by Millie08, Aug 3, 2018. I'm at Disneyland now and have some cute hidden mickey pins. But some of the hidden mickey symbols have connected ears, looks like the top of a heart shape instead of ear-head-ear. Does that mean they are fakes? Hope you understand what I'm saying because I am not sure how to post a pic right now. Not to discount them right off the bat but it does make them suspect; usually you get this feature from counterfeits/scrappers as the mold's detailing have been worn down considerably. Do you have pics of them? Most likely yes. The mickey head on real HM is very defined. It’s hard to say without pictures. It is hard to say for certain without a pic. But here is they way I like to think of it. If you make copy's of stuff the edge starts to get not as sharp. I will go as far as to say the Mickey head looks blurry around the lines at times. Here is the kind of tricky part. You want to not focus on just one thing wrong. Disney can and has let out pins with stuff wrong but usally it's one thing and it's small. But on a fake pin they have almost always had more than one error. Look at the back for the trade logo. The fakes have more of a raised looking stamp. When we first started I thought it looked pretty nice and must be the real pin. But I learned that infact the fakes have more rased back logo. The true hm will have a back logo that is kind of smooth and dosnt rase up a lot. Last and not least. Pins have a sound. You need to tap the pin on something hard and solid like a marble countertop. Do this with a few pins from the same set and you will hear the fakes. They most often will make a "ting" kind of sound. 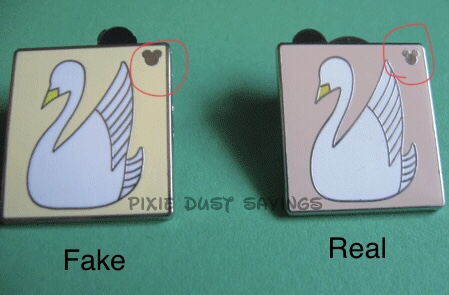 It is a noticeable difference between the real pin and the fake. Use thes hints and any other multiple checks to help you out. If you think a pin is bad, it is ok to tell the CM you decided not to trade for whatever reason. Oh also look for the print out here that will help be a guide for you. It has lots of points I did not go over like the back waffles and boarders. Best of luck to you. The one thing to remember is have fun. Do not try to force things.... Let the Disney Magic happen on its own. It honestly just depends. Pictures do help a ton though. Its very hard to tell nowadays because the quality of the unofficial pins is so good, so I just ask to see a pin before I trade, but at the same time I've been doing this enough to know which ones are real over fakes. In time you will be able to tell. We are always here to help too! You guys are so wonderful. I appreciate the help. We are home now and am going through our pins. I am attaching pics of the questionable ones. Hope I did the pic uploads correctly. My daughter really enjoyed pin trading. I will have to buy more for her to trade as we live in Hawaii and will probably drive over to the Aulani to continue the fun!